Two events have proved climactic for the Arab world. One was the spark lit by a vegetable seller in Tunisia leading to the unseating of the country’s ruler resulting in the 18-day popular revolt in Cairo’s Tahrir Square and the end of 30 years of Hosni Mubarak’s rule. The other was the spectacle of an ailing Mubarak lying on a hospital bed in a defendant’s cage in an improvised court facing Egyptian justice. As the Arab Spring stretched to a difficult summer, with Libya involved in a virtual civil war overseen by Western bombing runs, a wounded Abdullah Saleh recovering in Saudi Arabia while Yemen burns and a Syria resisting change as protesting Syrians call for a new order, the two markers for the Arab people remain as sentinels for the emerging truth: West Asia and North Africa can never go back to what it was. There will doubtless be many twists and turns to the continuing Arab story, but the old order has gone, however long it resists change. 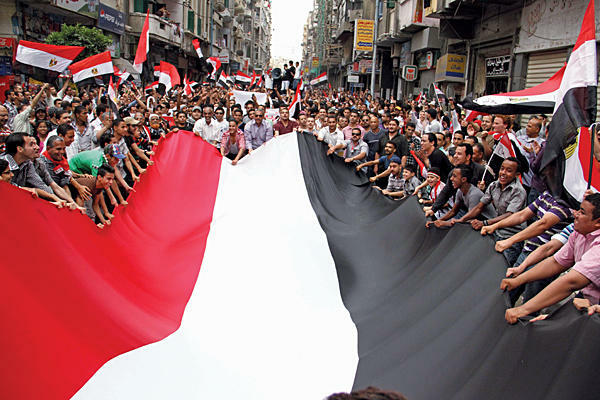 American academics are asking themselves how they had missed anticipating the Arab Spring and were almost unanimous in their view that unlike other parts of the world, the Arab world would remain frozen in time under autocratic rulers and their progeny and henchmen. To begin with, the United States’ geopolitical interests took precedence over other considerations, and these were in turn guided by protecting Israel and ensuring the smooth flow of natural resources, principally oil and gas, to America and its Western allies. American geopolitical interests are continuing to hold sway in Washington’s reactions to the Arab unrest. President Barack Obama came to the conclusion that the nature of the revolt in Egypt made President Hosni Mubarak’s position hopeless. But geopolitical interests triumphed over how Washington reacted to events in Bahrain as the majority Shias revolted and Saudi Arabia sent armed police to help the minority Sunni ruler. Bahrain is the home of the US Fifth Fleet. In Syria again, months of unrest have evoked murmurs of protest against Washington but little desire to unseat President Bashar Assad. Syria is too important a cog in the Middle East puzzle and its destabilisation would risk Israel’s continued occupation of Palestinian land. The important point for Arabs and the rest of the world is that the region’s future is still being defined even as peoples everywhere are discovering that Arabs also want freedom and authorities’ accountability to those they govern. Periods of repression will coexist with change as regimes and peoples sort out the kinds of government and rulers they should have. How outside powers reconcile their interests with fast-changing events will define to an extent the nature and speed of the changes. A primary challenge the region faces is the role of Islam in governance. There is a fear among secular elements that Islamists, in the shape of the Muslim Brotherhood or other more radical elements, will seek to usurp the space vacated by autocratic rulers. This is particularly true of Egypt where the Muslim Brotherhood is the best organised force while more secular elements are scrambling to set up organisations to contest elections. The Brotherhood is seeking to adopt a more moderate line to reassure the wider public of its credentials. Turkey assumes an interesting role in this power play in appearing as a role model for a modern Muslim state. Turkey’s Justice and Development Party has Islamist roots (the wives of both the President and Prime Minister wear Muslim head scarves) and yet has chosen a course of moving towards Europe even as it has established civilian supremacy over the powerful military and has been particularly active in the neighbourhood. It has, in the process, shed its close relationship with Israel, thanks partly to the ham-handed Israeli action in killing Turks in a flotilla that sought to break the siege of Gaza. The Gulf monarchies on the other hand are circling the wagons by seeking to enlarge the Gulf Cooperation Council by including Jordan and Morocco. The young Moroccan King, Mohammed VI, has shown foresight in trying to ward off protests by making modest proposals for reform to begin what promises to be a long process. The rulers of the oil-and gas-rich Gulf have the luxury of showering their peoples with goodies in exchange for their silence in how they are governed. How long this process will last is anybody’s guess. One consequence of the changes taking place in the Arab world is that Egypt, the traditional fulcrum in the region, could regain its central position it had surrendered for long by being complicit in protecting Israel and receiving a handsome annual subsidy from the United States. Egypt was the first Arab country to sign a peace treaty with Israel followed by Jordan and had even lost the right to host the Arab League for a time. Although there is scant prospect of Egypt abrogating the peace treaty despite its unpopularity in the country, the new Egyptian rulers will take a more independent line less subservient to US and Israeli interests. The remaking of West Asia and Africa will take time and tears, but the future promises to be more rewarding, if more turbulent, for the peoples who have stood up to be counted. It will also impact an Israel that has been nervously watching the changes in the Arab world as old certainties are demolished one by one. Israel has been sitting pretty under a Right-wing government enjoying the Washington elite’s unquestioned support while continuing to expand illegal settlements on occupied land and seeking to expel Arabs from the Palestinian East Jerusalem. Israel’s uncertain future is further underlined by massive internal protests over the rising cost of living for ordinary Israelis while the rich become richer. Israelis, as Arabs, are in the vortex of a new spiral of events that will change their future even as outside powers’ ability to influence events will diminish in proportion to the peoples’ ability to hold those who rule to account. This post was originally published at Asian Age.